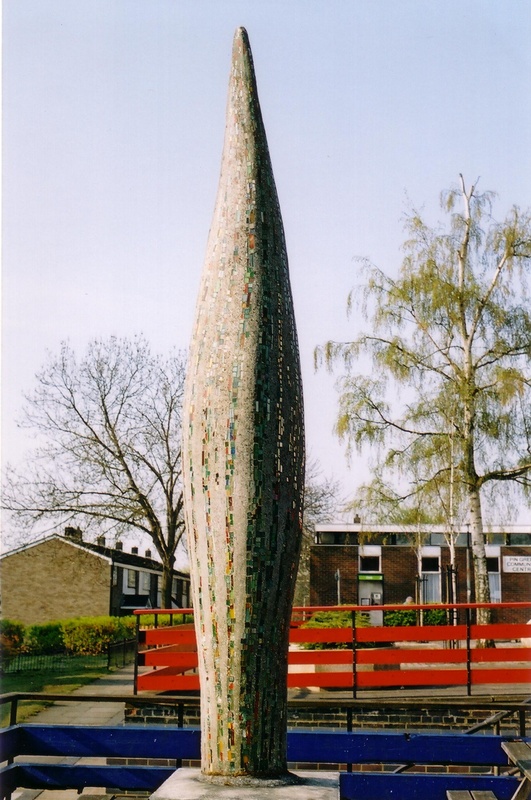 This reinforced concrete and mosaic sculpture was placed outside the King Pin pub in Archer Road in 1965. I haven’t been able to find out anything about its sculptor or history – can you help? Agnes Charles also created the stained glass windows in the porch of St Giles Church, Codicote as well as the plaster mosaics placed over the chancel. Thank you for confirming that the artist was both a sculptress and stained glass designer! Thanks to Hertfordshire Archives and Local Studies, the mystery has been solved! They traced an article by G.M.Lowe, published in Town and Country Planning, vol. 35 no. 11 Dec. 1967 p. 575. A most unusual inn sign at Stevenage. This concrete plantain leaf, with its veins of stained glass, is the work of Miss Agnes Charles, a Hertfordshire sculptress and stained-glass artist, and was commissioned by Messrs Greene King, owners of the public house. In a barn at her studios she built wooden templates for the leaf and used the method of “aggregate transfer” to create the veins. The stained-glass pattern was laid out in a mould lined with a mixture of “Polycell” and sand to hold it in place when the concrete was poured. When the concrete was cured, this mixture was hosed away, leaving the stained-glass pattern firmly in place. The sign is 14 feet high and weighs 2 tons.